10 Dec – The main contractor has been revealed for the new Lyell Centre for Earth and Marine Science and Technology, designed by PagePark. The building will house the Scottish headquarters for the British Geological Survey (BGS) as well as a major joint BGS/Heriot-Watt University research centre for geological, petroleum and marine sciences. Designed by PagePark, Arups and Ian White Associates, the centre will provide offices, research laboratory areas, aquarium laboratories and associated working areas, a central core containing welfare facilities, ancillary meeting areas, as well as external landscaped areas. 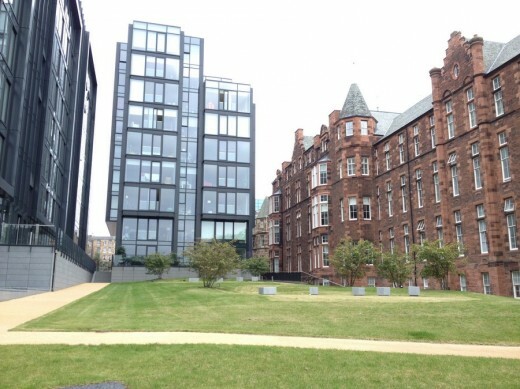 3 Dec – PagePark’s redevelopment of St Cecilia’s Hall on behalf of the University of Edinburgh is to get underway this spring following the award of planning and listed building consent, reports Urban Realm. 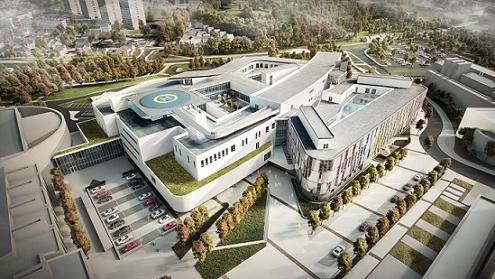 The major development will create a new home for services from the Royal Hospital for Sick Children, Child and Adolescent Mental Health Service and the Department of Clinical Neurosciences next to the Royal Infirmary of Edinburgh. A decision on the plans is expected to be received later this summer with work on the new hospital due to start before the end of 2014. Earlier this year consortia, Integrated Health Solutions Lothian, were chosen as the preferred bidder to design, build, finance and maintain the new hospital. 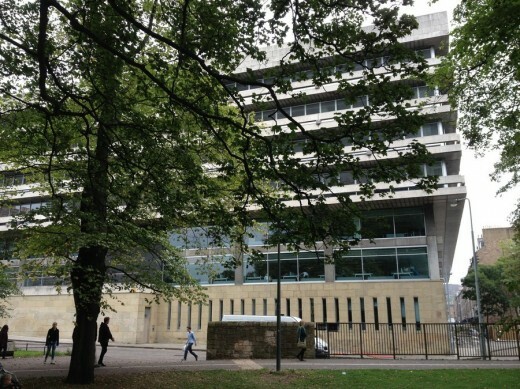 The new, six-floor development (including basement), will be linked to the Royal Infirmary of Edinburgh via the separate children and adult Emergency Departments. The facility will have an atrium with a shop and café, a stunning skylight linking both the Royal Hospital for Sick Children and Department of Clinical Neurosciences entrances, a high percentage of single en-suite rooms with good natural light and a helipad on the roof. 14 May – Muse Developments has lodged a detailed planning application with Aberdeen City Council for the £107m Marischal Square development to transform one of the key locations in Aberdeen city centre. 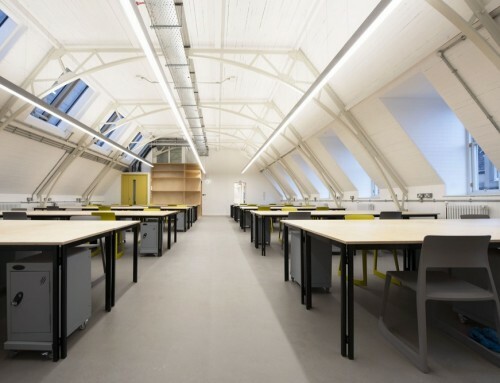 Delivered by ISG this saw an existing building extended to provide additional teaching accommodation, library, IT suite and study areas together with refurbishment of an existing lecture theatre. 14 May – An iconic cow sculpture will have to be removed from the outside of a restaurant after retrospective planning permission and listed building consent was refused today. Kyloe Restaurant and Grill put the brown and white cow on the front of their eatery on Rutland Place in Edinburgh when they opened two years ago. It protrudes from their window and looks over the west end of Princes Street. In December 2013, owners Signature Pub Group received a letter from the council giving them 21 days to take down the cow. The City of Edinburgh Council said they had received a number of complaints about the sculpture. Gareth Hoskins Architects have been chosen ahead of Malcolm Fraser, John McAslan + Partners, LDN, MUMA and PagePark to win the head-profile competition to redevelop the Scottish National Gallery in Edinburgh. 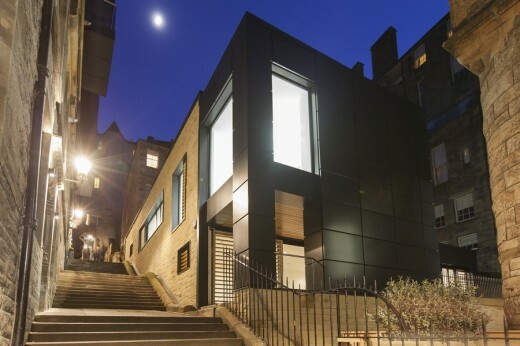 The practice will now carryout a full remodelling of the neoclassical building, rationalising interiors and opening up new gallery spaces, double the amount of display space available for Scottish art in the process. 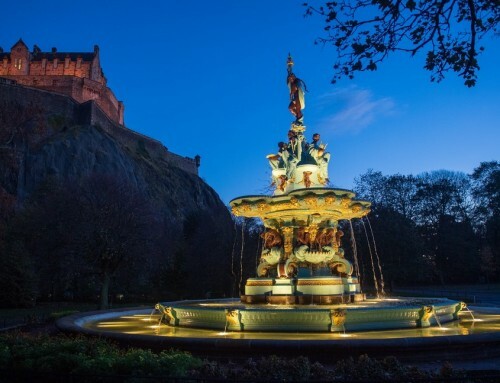 Improvements to visitor facilities, circulation and energy usage will be incorporated within that work together with more speculative ideas to rethink the neighbouring Princes Street Gardens, illustrate the transformative potential of the scheme. 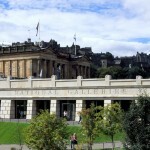 Gareth Hoskins has already designed a new home for the National Theatre of Scotland and completed a £4.7 million redevelopment of the National Museum of Scotland. Exact details of the latest commission have yet to be announced however it is understood the project will double the display area for Scottish art inside the prestigious galley. Improved visitor facilities, circulation and energy efficiency are also expected to be on the cards. 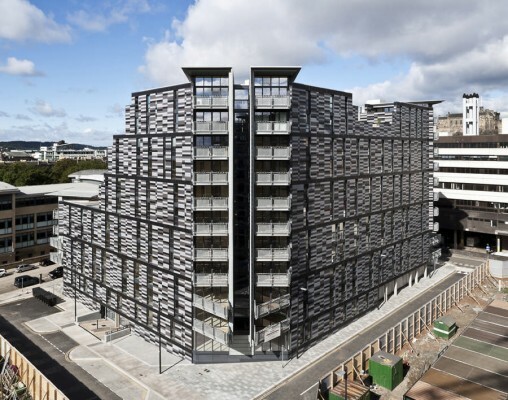 Gateway Apartments Student Accommodation, Edinburgh has been announced as the winner of the Residential Property category of the RICS Scotland Awards 2014. 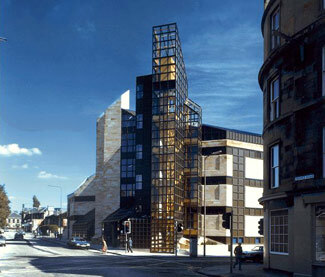 The awards, organised by the Royal Institution of Chartered Surveyors (RICS) in Scotland, recognise the achievements of land, property and construction projects across eight categories – Design through Innovation, Building Conservation, Regeneration, Residential Property, Commercial Property, Infrastructure, Tourism & Leisure and Community Benefit. The residential project comprises of a 170 bed high quality student accommodation development within a tenement block adopting a collegiate style approach to student living. The series of self-contained blocks is set within an exclusive courtyard intended to inspire students, encourage community, and enhance their time at university. Whitbread PLC, the UK’s largest hotel group, has announced the launch of its new hotel concept, ‘hub by Premier Inn’ with the second location in the brand to be opened in Edinburgh, at a location yet to be confirmed. The new concept will target major UK city centres such as Edinburgh and London, with the first ‘hub by Premier Inn’ to open on St. Martin’s Lane in London in summer 2014. ‘hub by Premier Inn’ is a new generation of compact, city centre hotel with contemporary room design and connectivity that will offer good value for money and appeal to customers who value price, location and design over space. At 11.4 sq.m a ‘hub’ room is compact use innovative design every centimetre is optimised with a desk that folds into the Hypnos pocket-sprung bed, luggage storage under the bed, an en suite bathroom with power shower, free wifi and a 40” inch smart screen TV. ‘hub by Premier Inn’ will be the UK’s first hotel with its own app, letting customers control their hotel experience. The ‘hub’ app means customers can book and check in online, as well as pre-select their room temperature and light settings. 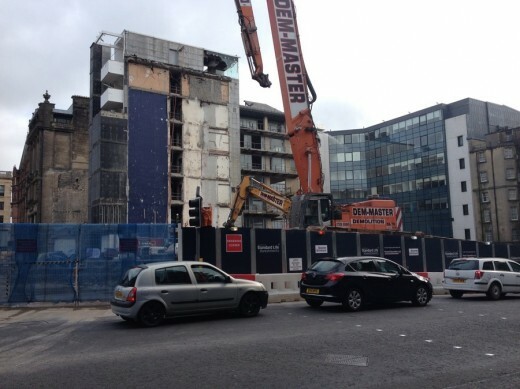 A former warehouse once used by the Scotsman newspaper is to be demolished and replaced with a seven-storey hotel. The mothballed printworks in Market Street has fallen into disrepair and is now on the At-Risk register after lying derelict for more than two decades, the city’s Evening Times newspaper has reported. 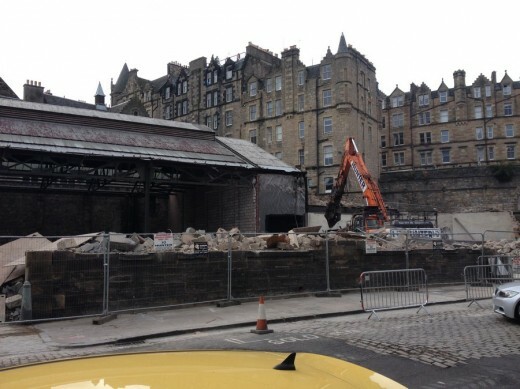 Arms-length council property firm EDI owns the site. The Cockburn Association is critical of the plans. 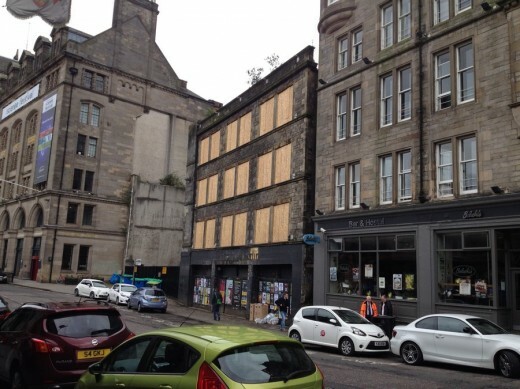 A planning bid has now been launched to transform the crumbling building into a 113-bedroom hotel – a move that will plug a neighbouring gap site of 40 years (which was destined for the Edinburgh Science Centre designed by Reiach and Hall Architects). Dundee’s V&A Museum of Design will appear to float on water following an additional £8.3m investment from Scottish Enterprise. The funding, announced today by Finance Secretary John Swinney, will be used to create a new waterfront area to surround the Dundee building and complement its spectacular design. Separate to the V&A Dundee building costs, the cash will help create an attractive environment around the museum, providing visitors with an outstanding first impression worthy of the first purpose-built design museum in the UK outside London. The building contract for the £15m third Don crossing will go out to tender next week, signalling the beginning of construction work in the summer. Aberdeen City Council’s finances, policy and resources committee meets in June and will then be in a position to award the contract for the project. Completion is due for Autumn 2015. 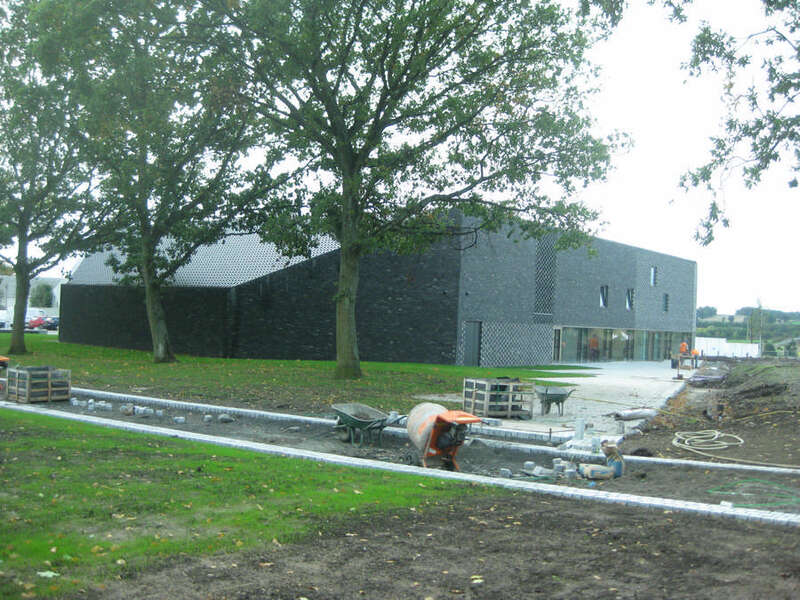 Building work will begin in July or August 2014. Dundee Science Centre is planning a major expansion to give it a greater presence in the £1 billion waterfront redevelopment. It has received an £850k grant from the Wellcome Trust to form a mezzanine level and create a new medical technology exhibition. The Scottish Federation of Housing Associations (SFHA) has called on the Scottish Parliament to endorse reduced Right to Buy notice period from three years to one. The Scottish Government proposes to end the policy which was introduced by Margaret Thatcher in the 1980s and gives eligible tenants the opportunity to purchase their home at a discounted price. The conclusion formed part of the Committee’s stage 1 report on the Housing (Scotland) Bill was debated on 24 Apr. Springfield Properties has withdrawn its plans for a 1,500-home village near the Cairngorm mountains after an evolution of “business priorities”. The proposal, which would see the village developed in the Cairngorm National Park Authority next to the River Spey over 20-30 years, has been agreed in principal. Updated Images of this six-floor city centre shopping centre that has recently been refurbished. Commonwealth Games organisers wisely drop the demolition of the Red Road flats from the Glasgow 2014 opening ceremony. NHS Lothian has unveiled plans for a major new cancer treatment and research centre to be built at the Western General. Scottish homebuilder Springfield Properties has announced plans for 228 new homes to the west of Dundee. Following two consultation meetings with the public earlier this year, the housebuilder lodged plans with Dundee City Council for the homes at South Gray, within the Western Gateway. 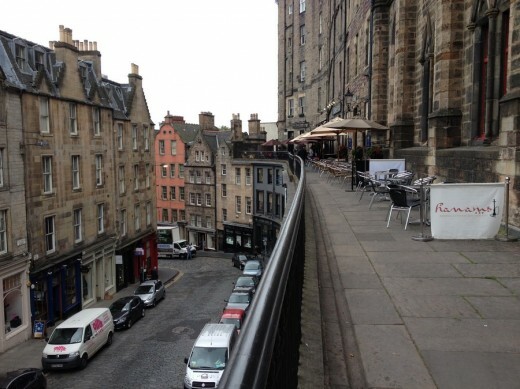 The EDI Group is giving the public a final opportunity to have their say on a proposed master plan for Edinburgh’s Fountainbridge district ahead of submission of a planning application in principle next month. 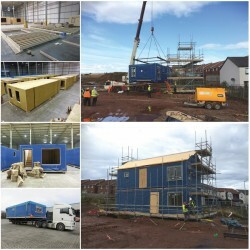 7 Apr – Ben Dawson Design : Manufacturer and Fallen Tree Rising have moved to new headquarters in Prestonpans, near Edinburgh, Scotland UK. We have new office, studio, machine shop and cabinet shop. We have a woodland where we have already started milling fallen trees and putting planks ‘on stick’ to season. 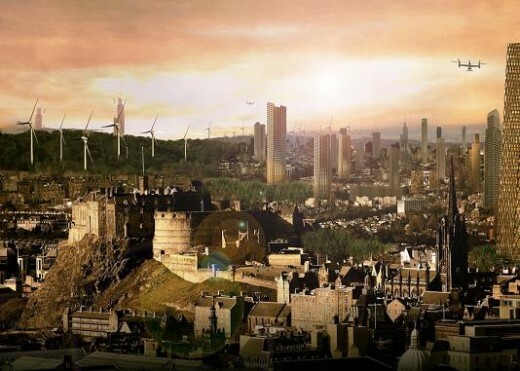 A concept image has depicted Edinburgh in 2044 with a skyline filled with glass and steel skyscrapers and surrounded by giant wind turbines. Released by promoters of new British sci-fi film ‘The Machine’, the picture imagines the changes brought by a near future Britain engaged in a cold war with China. While the World Heritage landmarks of Edinburgh Castle and the Hub building remain untouched, vast swathes of the city are dominated by towering skyscrapers, and Princes Street appears to have become the home for a huge Shard-like construction. In the distance the Pentland Hills have become a forest of gigantic wind turbines. More than £90m is to be spent over next three years in building “much-needed” council houses and upgrading existing properties in Aberdeenshire. 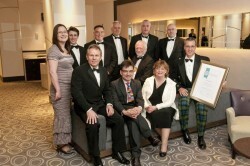 The Royal Incorporation of Architects in Scotland (RIAS) has announced a 27 strong shortlist for its 2014 awards. 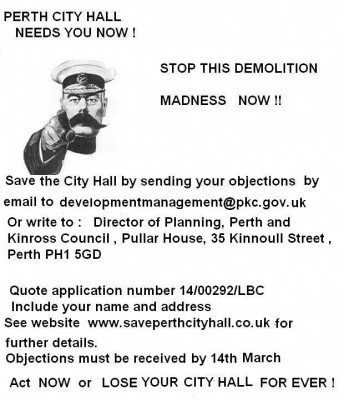 All objections to proposals for the Perth City Hall Building area must be sent to the council by Friday the 14th of March 2014. If you are yet to do so please email the council with your name and address and statement of objection. The application number is 14/00292/LBC and the address to send it to is developmentmanagement@pkc.gov.uk. 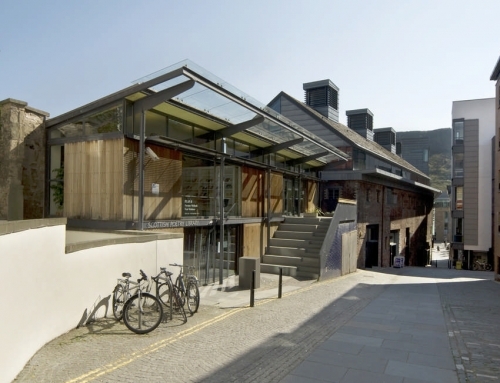 An article by Neil Baxter of the RIAS appeared in the Press on the 13th of March and Margaretha Linacre handed in about 2,000 letters of objection to Perth and Kinross Council’s office in Kinnoull Street. Surely we have plenty of issues we could be focusing on, such as improving the quality of our built environment, removing plaqnning red tape and improving design team fees. Here is a press release from the RIAS, however it should be noted that judging other countries is a very slippery slope, as Libeskind found out when he publicised his anti-China stance – if you start to analyse each country in depth you will find problems from human rights to corruption that are constantly shifting. I think we should look out to the world and engage (of course, just look at e-architect) but I would expect the RIBA and RIAS to focus on issues in our own country – Ed. Issued Wednesday 12th March 2014 – At the behest of the Royal Institute of British Architects’ (RIBA) immediate Past President, Angela Brady Hon FRIAS and joint member George Oldham, the Royal Incorporation of Architects in Scotland (RIAS) is taking a stance through the UIA (International Architects Union) against the aggressive use of new buildings as a mechanism to support a ‘land grabbing’ offensive. Ogilvie Construction has broken ground on an £11 m project to build an eight-storey student accommodation building, to be called Arran House, in the Fountainbridge area of Edinburgh. Due for completion in 2015, the project was awarded to Ogilvie by the Student Housing Company and will provide 302 high quality student apartments of varying sizes, along with retail space on the ground floor. Ogilvie will also complete infrastructure works and a new junction for the Western Approach Road, one of the main routes into Edinburgh. 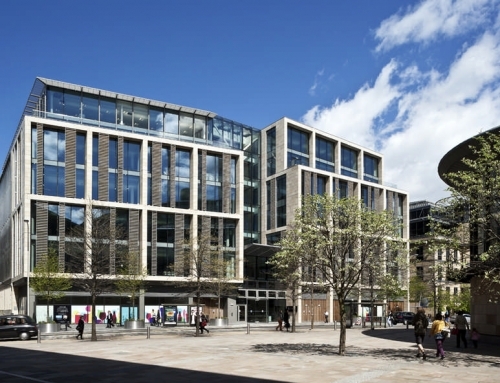 The best new commercial and public property developments in Scotland have been announced at the inaugural Scottish Property Awardscelebrated at a sell-out event in Edinburgh on 27 Feb.
A day of protest is to be held this Saturday, March 1st outside the City Hall at ten o’clock, to coincide with Market Day. We need as many volunteers as possible to hand out leaflets to the public at the market, and to passers by. The papers have been informed as have the BBC and STV. It is vital that we show the maximum support possible at this crucial time during the period of objection. It will be a pleasant and friendly occasion and I’m sure the public will very much support our efforts to preserve the City Hall. 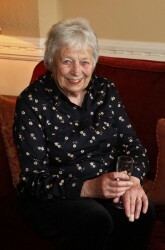 The Edinburgh Fire Research Blog reports, “It was with great sadness that we learned of the passing of Dr Frank Rushbrook, CBE on the 17th February 2014, aged 99. Frank was a true visionary who will forever be associated with the creation of the academic discipline of Fire Safety Engineering at Edinburgh and was a life-long friend and supporter of the group. A £42m project to deliver 700 new homes in north Edinburgh is to get underway. The first wave of 193 homes are to be built on the site of the former Craigroyston High School in Muirhouse, with a further 500 to be built within the next ten years. 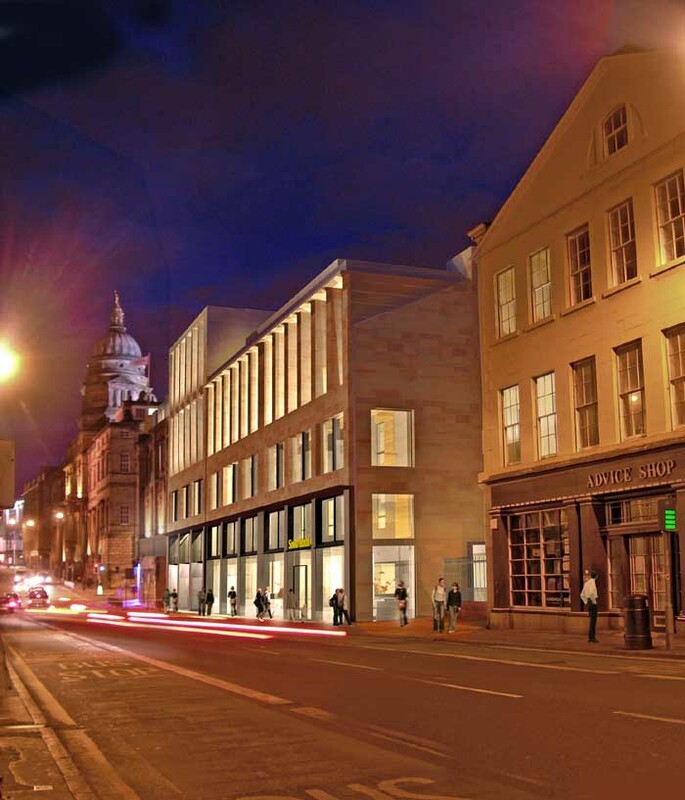 EDI Group has submitted a proposal of application notice for the development of a long-standing gap site on Edinburgh’s Market Street, straddling the Old and New Towns, reports Urban Realm. JM Architects have been brought on board for the development which would entail demolition of an unlisted garage building. Rising to seven storeys in height the new build property would incorporate associated bar and restaurant facilities. 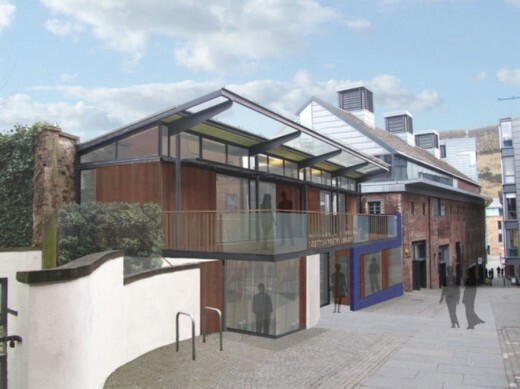 A 12 week pre-application consultation for the 103 room hotel is currently underway; with a preview of the plans to be held at the City Arts Centre, fifth floor gallery, on 10 March between 15:00 and 19:00. 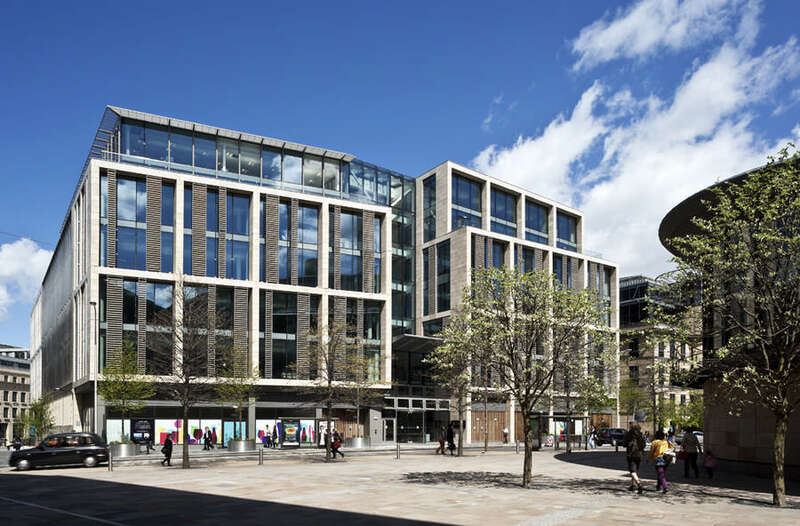 Work to demolish Edinburgh’s B-listed former Scottish Provident building is to commence immediately following its acquisition by Standard Life Investments, reports Urban Realm. As the SoCo development completes the Edinburgh Evening News has produced a video about this major inner-city development on the Cowgate and South Bridge. 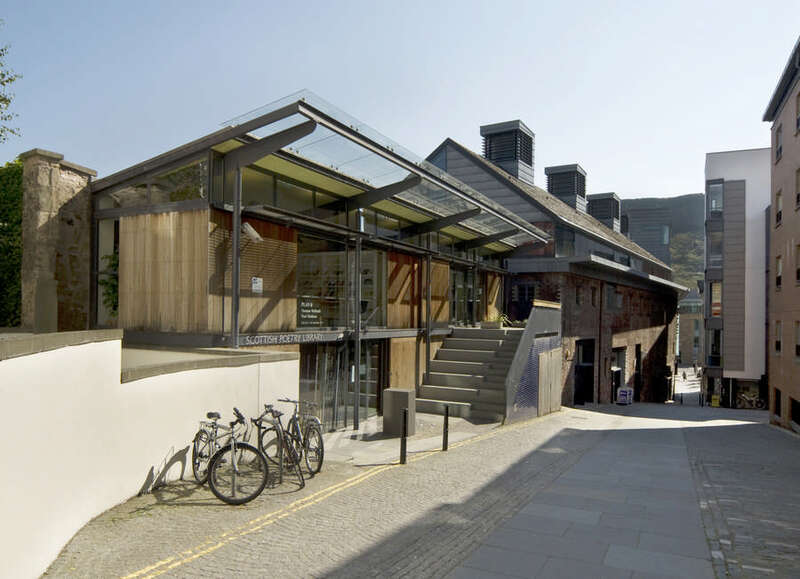 Malcolm Fraser, architect of the Scottish Poetry Library, has called on Creative Scotland to think carefully before agreeing to fund its ‘despoilment’ – following submission of a planning application which calls for a radical expansion of the collection. 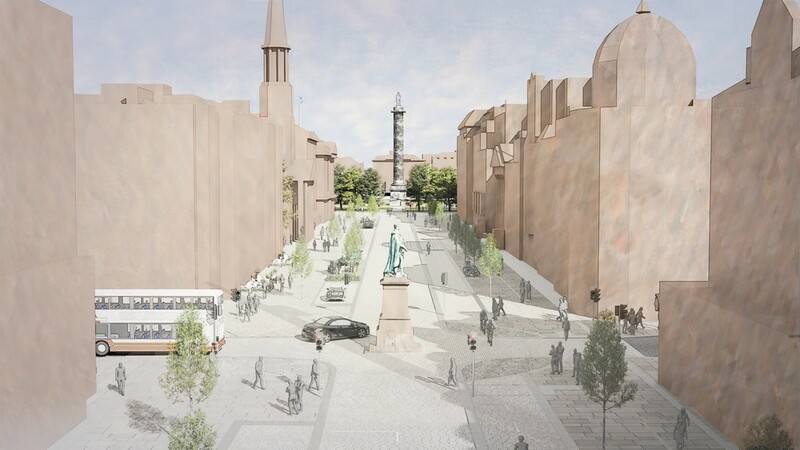 The outline of a masterplan for Aberdeen city centre has been unveiled to the City Centre Regeneration Board. Scottish architectural practice Keppie has strengthened its senior team with the appointments of Gordon Hood and Adrian Boot as directors of the business with immediate effect. Adrian and Gordon (both with RMJm for many years) have developed a strong partnership borne out of delivering high profile projects together, including the multi-award winning Engineering Building at the National University Ireland (NUI) in Galway. The new recruits will work closely with existing director of Learning, Peter Moran, who moves to a role heading up Keppie’s public sector business, covering both healthcare and education projects. In line with his experience of cross-working across hubCo territories and various frameworks, Peter will deliver strategic oversight in this sector. Managing director Martin English said: “This latest news brings our total of new recruits starting within the last six months to well over 30. Over the course of the last few months we have been on a steady course, recruiting senior specialists who can add value to our offering. Plans for a new Lairdsland Primary School in Kirkintilloch progressed as the partners involved in the £7.7 m project achieved financial close. 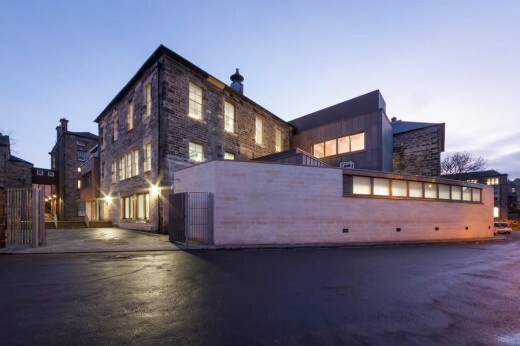 In collaboration with SFT, the building has been designed by architects Walters and Cohen and is being used as one of two reference designs for new primary schools across Scotland. The landmark agreement was reached between East Dunbartonshire Council and development partner hub West Scotland and contractor Morgan Sindall allowing the first sod to be cut this month. Building works are set to run for completion before the summer 2015 break and the council is working with its partners with a view to delivering an earlier completion date if that is achievable. The team behind the new Queensferry Crossing has given an assurance it will remain open no matter the weather. The new bridge has been fitted with special barriers – modelled in a wind tunnel – that will prevent it from having to close in a storm. Officials made the assurances while unveiling a video of what the Forth’s newest £1.4bn crossing will look like. The top of the 820ft high central tower can already be seen emerging from the water and in the coming weeks both the south and north towers will also appear. All three are expected to be at full deck level by mid-summer. 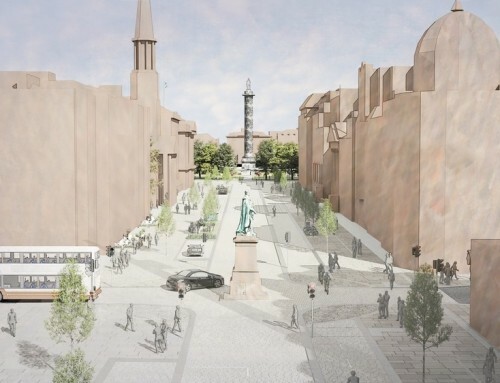 Hundreds of millions of pounds could be pumped into building projects in Dundee over the next four years, if councillors approve a new capital plan. Dundee City Council’s capital plan for 2014/2018 proposes a £270 million pound investment across a range of sites in the city. Under the plan, £55m will be injected into the schools building programme to build new primary and secondary schools, along with refurbishments at existing schools across the city. 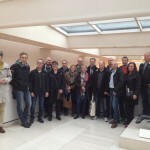 Recently e-architect organised walking tours in Edinburgh and Glasgow for a delegation of the top architects in Sweden. We showed the 18 architects – all directors of architecture practices between 20 and 400 people in size – around the key buildings. 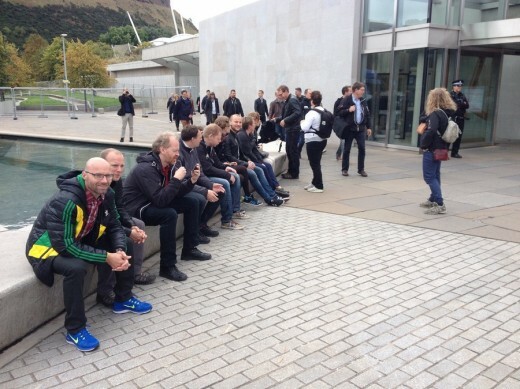 Each architecture office will now be offered walking tours in the two cities, so you might be seeing a few more Swedish architects walking round Edinburgh and Glasgow soon! Artists in Concrete Awards (AICA) Festival is annual celebration of excellence in architecture, landscape designing and interior designing. 13 Jan – Students challenged to create architectural fantasy – in a weekend. 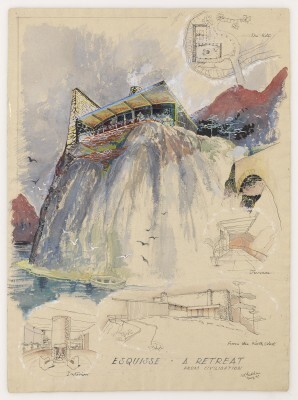 Students at Edinburgh College of Art (ECA) are being challenged to sketch out their architectural fantasies, in a competition that harks back to the 1930s and 40s. 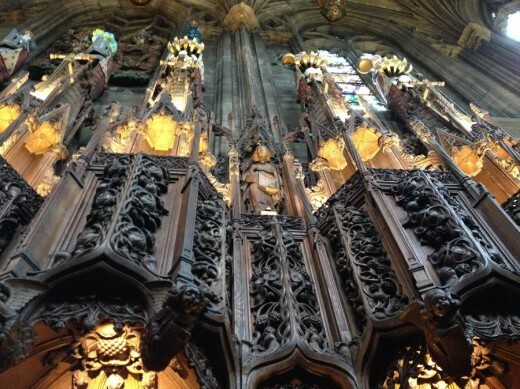 The Royal Commission on the Ancient and Historical Monuments of Scotland (RCAHMS) has devised the competition both for fun and to remind students of the skills that their forebears had to develop in the college’s early days – see more at January news page.